@socalitybarbie, 2015’s Instagram sensation, has an impressive 1.3 million followers on the platform, up from just over 7,000 back in September. Although not as popular as @taylorswift (with 60.4 million Instagram followers), @socalitybarbie’s mysterious curator, only recently revealed as photographer Darby Cisneros, far exceeded the attention she expected to draw with her parodic and intentionally provocative Instagram account. But what does this “liveauthentic” hashtag communicate? And against whom or what exactly does Cisneros direct her witty, playful, image-driven diatribe? As various news media have attested, @socalitybarbie critically parodies hipsters, Instagrammers, iPhone photographers, nature and hiking imagery framed with inspirational quotations, and hyper-curated strategies of visual self-representation on the subjects of travel, foodie cooking tips and restaurant suggestions, high quality coffee shops, and other artisanal consumer patterns. But working in the anthropology of religion and the study of digital media language, one might point out that journalists too quickly gloss over—or completely ignore—the evangelical roots of @socalitybarbie’s criticisms. Make no mistake; Cisneros takes issues with hipsters and Instagrammers. She directs her ire, however, toward a recent brand of aesthetically inclined evangelicals. 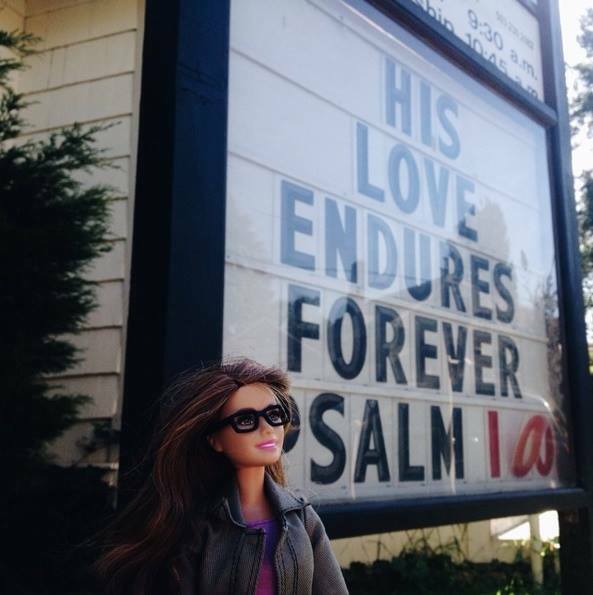 @socalitybarbie is both a Christian discourse, in a narrow sense, and an encompassing media ideology, in a broad one. Authenticity language, in these debates, operates hand in hand with discourses of religious orthodoxy. A bit of background on the Socality organization—whose title stems from a complicated acronym: “We are a (SO) social (C) community (AL) all for eternity (ITY)”—will help us trace the origins of the hashtag(s) in question. The group’s “Who We Are” page self-describes as a Christian organization. Socality is an institution that postures itself, using popular buzzwords, as a “community,” “collective,” or “movement,” “designed with purpose initiated by people and aimed at bringing the heartbeat of God to humanity.” Socality intends to mediate or construct bridges of connectivity between a person’s presence in the online world and so-called “real life,” or what one might take to mean existence outside of digital networks. The organization aims to function, in other words, as a communicative technology or platform that erases or blurs the gap between the local and the global, the real and the hyper-real. Creation of online spaces of belonging and a transitioning of those very spaces into less-mediated, “real life interactions,” in fact, constitute Socality’s mission. “Authenticity” and “authentic” relationships, as Cisneros will later take to task, are rhetorics central to the network’s identity. Yet, Socality has what one might analytically construe as a religious agenda. “We are committed to being a space where people can find community and work together in the common goals of social impact, community development and working out their faith,” the site details. As founder Scott Bakken writes, the group identifies as conservatively Christian with a reformist, minimalist bent: “At the core, we believe in Jesus and the gospel He teaches through the Bible. We want to get back to the basics and focus on the central theme of Jesus, which is about loving God and loving His people.” (Bakken and his spouse, notably, trained for five years at Australia’s evangelical megachurch and home of the contemporary music empire, Hillsong Church.) The network, to summarize, is a visually narrative socio-religious platform, with the goal of inspiring communicants by telling stories with pictures. Making use of socially descriptive, self-affiliating micro stances (i.e., hashtags)—often via interconnected platforms including Twitter, Facebook, or Instagram—Socality efforts to build a community extending beyond both online and material worlds. Contrary to Socality’s depiction of such a process, authentic Christian living involves much more than curating aesthetically pleasing pictures framed with Christian inspirational texts. Living as “a follower of Jesus is hard work,” actually, “and there are a lot of ugly and difficult things we encounter in our walks with Christ.” Cisneros’s suggestions for improvement for Christian Instagrammers include (1) resisting “curating every image” and (2) avoiding using the dubious “live authentic” hashtag originated by Socality proponents. By way of a conclusion, I’d like to issue some critical reflections on the @socalitybarbie media event and ensuing contestations online. Indeed, the experiment does submit a trenchant depiction and rejection of what one scholar of media and consumption has described, in a Bourdieuian vein, as a “taste regime” or set of discourses that seek to “tell us how to prop our lives, how to set a dinner table, what not to wear, and more importantly, where to hang that fake antler in our living rooms.” Pervasive visual ideologies “prescribe us ways to document our lives.” Both @socalitybarbie’s images as well as the unabashed endorsements of her work by journalists, then, fall squarely into the analytic category of media ideologies, or discourses posited by various social actors in elaboration of the ways media ought to be correctly used. On the other hand, Cisneros’s project itself is ripe for critical discourse analysis, especially from a religious studies standpoint. What @socalitybarbie offers is an embedded discourse, a criticism-within-a-criticism. Socality, forming in 2014, postured itself as a better form of Christianity than the alternatives and in doing so rejected existing rituals and forms of practice as limiting or insufficient; @socalitybarbie agrees with much of Socality’s agenda but sees it as a largely failed or shallow attempt at a more genuine possibility of living. The contestation between Socality and Cisneros is, in point of fact, an insider’s battle between emic claims re: correct Christian deportments. Consider again the photographer’s language in the above paragraph. What Cisneros vies for is an allegedly more “authentic” mode of existence, a profound and ostensibly deeper way of following Jesus and engaging social networking apparati. The @socalitybarbie debate is a landmine for scholars of religion as it both elaborates and maintains a compellingly broad media ideology—with which even secular media outlets appear to agree—and reveals strategies and tactics for the management of evangelical registers of orthodoxy and correctness. Instagram, whatever its exact social effects, is a productive means of social boundary maintenance on a number of levels. Hashtags, by this reading, operate simultaneously as micro-commentaries, theological stances, and performances of socio-cultural identities, aesthetics, and affiliations. This entry was posted in Religion and Popular Culture, Religion and Society, Religion and Theory, Theory and Method, Travis Cooper, Uncategorized and tagged @socalitybarbie, Darby Cisneros, Evangelicals, Facebook, Hillsong Church, Instagram, People Magazine, Relevant Magazine, Scott Bakken, The Atlantic, twitter. Bookmark the permalink.